There are still two and a half more weeks to vote for Fulton County Sheriff’s Office’s K9 Officer Fazzo in the Vested Interest Photo contest. Fazzo and his handler, Deputy Justin Galbraith, are the only team in Ohio of 30 featured in this nationwide contest. Vested Interest is a non-profit organization whose mission is to provide protective vests and other assistance to dogs of law enforcement and related agencies. Voting runs through 11:59 p.m. on Oct. 31. The K9 team with the most votes wins a Chevrolet Tahoe equipped with K9 customizations for patrol. Every person is allowed to vote once every 24 hours. Vested Interest in K9 can be found on Facebook, Twitter, and Instagram. https://www.fcnews.org/wp-content/uploads/sites/45/2018/10/web1_Fazzo-and-Galbraith.jpgThere are still two and a half more weeks to vote for Fulton County Sheriff’s Office’s K9 Officer Fazzo in the Vested Interest Photo contest. 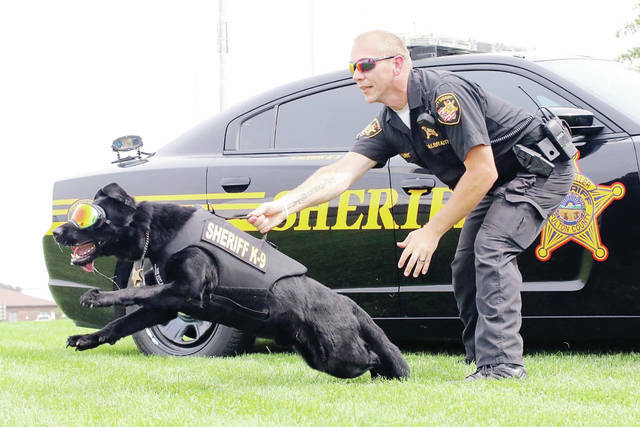 Fazzo and his handler, Deputy Justin Galbraith, are the only team in Ohio of 30 featured in this nationwide contest. Vested Interest is a non-profit organization whose mission is to provide protective vests and other assistance to dogs of law enforcement and related agencies. Voting runs through 11:59 p.m. on Oct. 31. The K9 team with the most votes wins a Chevrolet Tahoe equipped with K9 customizations for patrol. Every person is allowed to vote once every 24 hours. Vested Interest in K9 can be found on Facebook, Twitter, and Instagram.